Blackheath is an old colonial town with an abundance of history. Surrounded by inspiring views and sustained by homely guest houses, Blackheath is a peaceful getaway. Located north of Katoomba within the Blue Mountains, Blackheath was given its name by Governor Macquarie in 1815 as he noted that the area had a charred, wide-open, heath-like appearence, hence the name Blackheath. Despite the "charred" reputation that follows a name like that, Blackheath is surrounded by breathtaking views of nature's beauty. Numerous bush walking tracks are open for wandering. Follow the track to Evans Lookout. From Evans Lookout road the Grand Canyon walk begins, and you find yourself heading from Neates Glen up to Beauchamp Falls. The track unravels witho special views. A small detour will place you at Walls Cave, which was occupied 12,000 years ago by Aborigines. 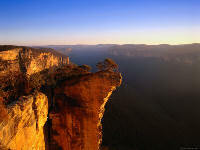 Along with Evans Lookout, Govetts Leap offers great views of the Grose Valley, while also offering various walking tracks leading to Bridal Veil Falls, Luchetti lookout, Trinity falls or Horseshoe Lookout. The Rhododendron Festival held each year in November is a major tourist attraction for Blackheath. People congregate for a variety of activities - including the chainsaw competition - but it's the flowers that are the major drawcard. They are a site to behold as you visit the Blackheath Rhododendron Gardens. Other tourist attractions include The Scotch Thistle Inn's original staircase (this is the inn that Charles Darwin once visited), Victory Theatre and Memorial Park. Wanting an Easter holiday but have no idea where to go? Blackheath is a great option. In the midst of the Blue Mountains, the Blackheath Art Societies Members Exhibition is on offer during the Easter period. With many hidden treasures scattered along the walking paths, Blackheath is a beautiful and relaxing place to visit. You can stay at accommodation within the Blue Mountains and enjoy early morning scenic walks, breathtaking views and clean crisp mountain air. There is so much to see and do in the Blue Mountains so if you are looking for an organised visit then try one of these tours.